As a high school athlete (1950-54) in Globe, Arizona, Ed Nymeyer was All-State in football, basketball and track and excelled in baseball and golf. He set every school basketball scoring record, many of which still stand today. 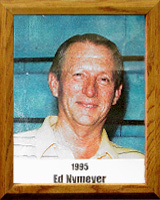 With a full basketball scholarship to the University of Arizona, Ed continued to hit the cinders (low hurdles), putter around the golf course and dribble his way into the history books on the basketball court. He was the Wildcats’ leading scorer all four years of his career and set the then all-time scoring record with 1,225 points. He is the last and only UA male athlete to letter in three different sports: basketball, track and golf. Ed taught and coached one year at San Manuel, then came to Flowing Wells High School where he taught and coached for 36 years and became the “winningest” volleyball coach in Southern Arizona. (In 1992 he won his 218th match, surpassing Catalina’s legendary Mary Hines). Ed coached All-Star teams and has been state basketball and volleyball “Coach of the Year,” as well as state director of the National Federation of Interscholastic Coaches Association and served on the board of the Arizona Coaches Association. In 1995, Nymeyer added another page to the record books as the only coach in Arizona history to win 300 games in two different sports (basketball and volleyball).